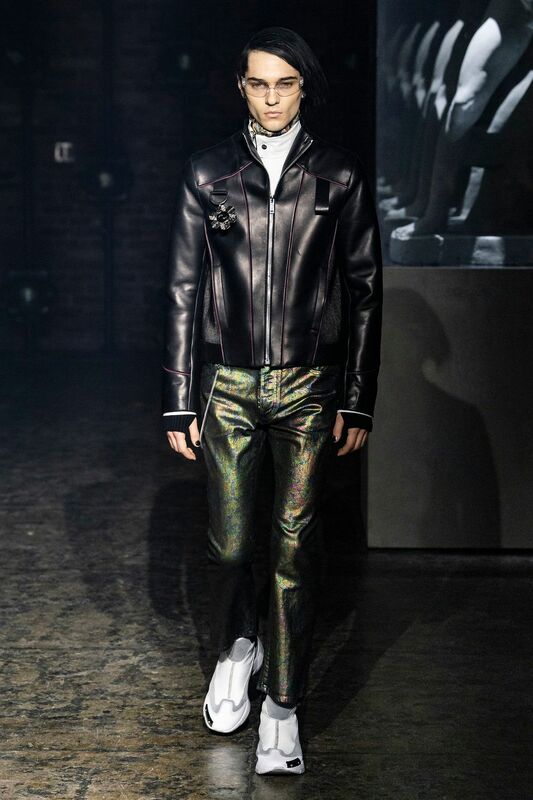 Palm Angels, the Italian fashion brand led by Francesco Ragazzi, made its NYFW debut on Saturday. On a runway illuminated by a pulsing strobe light show and decked with a collection of imitated Grecian statues propped inside clear glass cubes, Ragazzi showcased a sleeker version of his creative ambitions. The brand's fall 2019 collection strayed away from the branded tracksuits and loose-fitting streetwear for which they're known. Instead, Ragazzi sent tailored leather and utilitarian motifs down the runway, signaling a notable shift towards sartorial elegance. Ragazzi's decision to hold his show in New York wasn't motivated by location — he knew he wanted to make an aesthetic transition. "I wanted to move away from streetwear here; the brand has to grow," Ragazzi told Vogue. "I wanted to bring it to New York but I didn't want to give New York something that it already had." The collection drew inspiration from classic uniforms while integrating the utilitarian pockets and camouflage print often seen on hunting and fishing outerwear. As a visual juxtaposition, the designer also incorporated pocket chains and cutoff blazers into the lineup, infusing a punk iteration into classic menswear references. The women's pieces cohesively trotted along the same aesthetic line. In addition to the referential use of beige, Ragazzi included bright colored pants, light textiles and tie-dye hoodies into the centrally dark color scheme. Palm Angels was promptly dubbed a fashion trailblazer following their 2014 debut. Applauded for their use of cultural references and strategic branding, the thematic range the brand has explored has attracted individuals across the industry. This appeal translated into the guest list at the Palm Angels fashion week party at 1 Oak on Saturday — drawing industry notables like Luka Sabbat, Slick Woods and Imaan Hammam to the celebration.